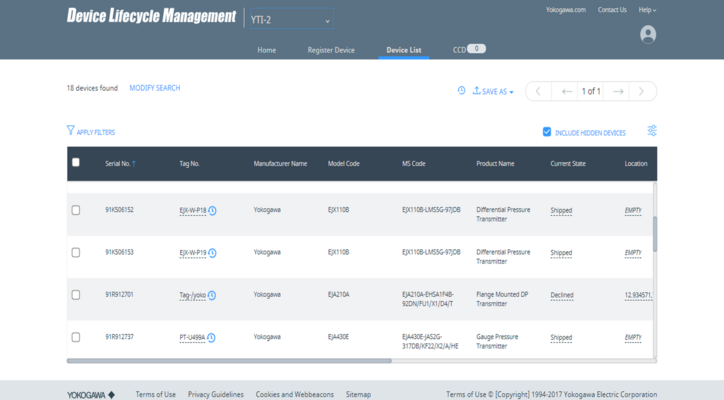 Yokogawa Electric Corporation announces the introduction of Device Lifecycle Management, a new IIoT cloud-based service for the management of information on plant assets. This is an information management support service for the digitised asset data of the IIoT era. The Device Lifecycle Management service allows customers to digitalise the management of all device information and helps customers to improve the efficiency of plant maintenance management and the quality of data management. Device Lifecycle Management is initially not available in China, Russia, Indonesia, Vietnam, India, and Japan. However, this service will be expanded to these countries in the future. Digitization of asset information is an important key to the automation of and the realization of efficiency in asset management. The newly developed Device Lifecycle Management service helps to minimize the amount of manual work that must be performed and improves the management of devices information.